On Elections, Young People and the Future : The Greek Alternative? A Few Days Away? As the pre-election circus in the UK goes on the road, Greece is but a few days away from a snap General Election, which could change the European scene dramatically. Within this scenario Greek young people have an opportunity denied to young people in the UK. They have the choice of voting for a political party, Syriza, opposed explicitly to austerity. If such a party existed in the UK I wonder how young people would respond? A Greek young woman, Elati, explains where she’s at. [In Greece] young workers were the ones hit hardest by unemployment – youth unemployment is over 50%. Those ‘lucky’ enough to find a job, even university graduates, will work for 250-300 euros a month or even unpaid to ‘gain experience’ or are tied to ‘voucher’ programs. Young men and women remain financially dependent on their parents, cannot afford a household of their own or to start a family and are often forced to emigrate abroad. [For Elati] Syriza is .. alone in advocating a Europe of the people and not a Europe of austerity. The EU seems to currently only care about protecting the powerful at the expense of the working class and young people, who are forced to accept constant work with no right to free time and a decent life, fully subjected to the neoliberal dogma of individualism and competition. Only Syriza, among Greek parties, wants to move Europe towards real democracy and respect of human rights and away from a fortress-Europe with drowning immigrants in the Mediterranean, away from bigotry, Islamophobia, racism and fascism. 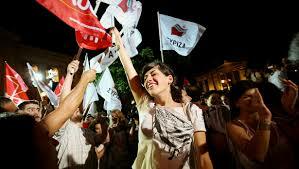 A Syriza victory, on the other hand, can give back hope both to the youth and to broader society. It can give us the hope which will enable us to raise our voices and actively take part in the country’s political life, from the local level to the unions, from the workplace to the universities. Syriza can give us back what the previous governments systematically denied us: the ability to fight for our dreams. Is there any comparative sense in which a British political party offers ‘the ability to fight for our dreams’? What do you think?